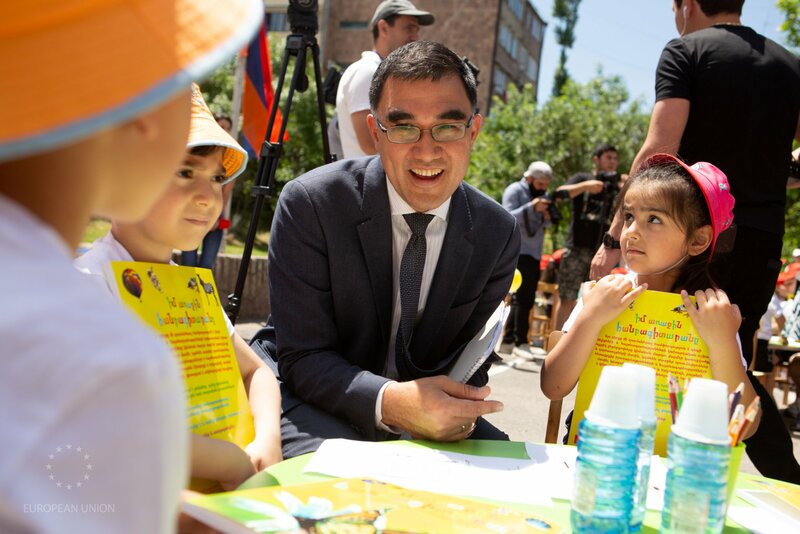 Almost 150 kindergartens in Armenia will benefit from a €5 million grant from the Eastern Europe Energy Efficiency and Environment Partnership (E5P), to which the European Union is the largest contributor. The project is implemented jointly by the European Investment Bank (EIB), the Municipality of Yerevan, the Green Climate Fund and the United Nations Development Programme. The grant represents additional support to the EIB’s loan of €7 million, signed in 2017. 29 kindergartens will be fully renovated, while 118 will benefit from a partial renovation involving energy efficiency measures. This will create a much safer and more comfortable environment for approximately 34,500 people, including pupils, teachers and staff members. This will contribute to climate change mitigation and reduce Yerevan’s municipal expenditure on energy services by around €1.1 million. The signature of the grant agreement was organised under the EU4Energy initiative and in the context of EU Sustainable Energy Week, which is the biggest energy efficiency event in Europe, aimed at encouraging citizens and stakeholders to discover and debate the major issues driving the transition to sustainable energy.